Here is another extract from TRUE TALES AND SILLY STORIES FROM THE T.T. COURSE, which is being put together by John Foster. Contributions are most welcome. It was June 1958, when I first went to the Isle of Man to see the world famous T.T. races. The mountain circuit made a big impression on me. I started racing on a 350 B.S.A. Gold Star machine and, after one Aintree and two Rhydymwyn (a very small circuit in north Wales) meetings, I was ready for my first M.G.P.! 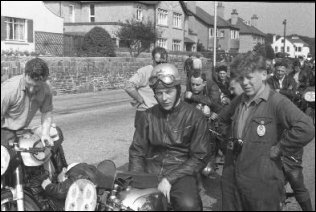 In August 1959 I entered my first Manx, but my debut got off to a very bad start and just got worse as the week went on. Everything that could fall off the bike did so, except me fortunately. It had big-end seizures, the lot. I soon realised that machine preparation was most important in the Isle of Man. By the end of the week I had put a lap in at 82m.p.h. -Not bad for an old bike with a map of the course on the tank to help me keep the bike on the black parts. All too soon it was time for the actual race. Everything was screwed down and wired up, and the weather was fine and dry. I had a long wait, being number 88 and starting at 10 seconds intervals, but then it was my turn to push and hope the machine would fire up first time. I got a very good start, and set off to the fearsome drop down Bray Hill. All was going well until I got to Sulby. I saw two bikes ahead, a Norton and a 7R. I thought to myself, I will show these guys how my newly converted, twin leading shoe, B.S.A. brake works. I shot past these unsuspecting riders, hard on their brakes and tipped the bike into the right hand corner at Sulby Bridge. But what they did not know, and I did not know at the time, was that my homemade, primary-chain oiler tank had split, and emptied its contents all over the back tyre. I was heading speedway style, on full lock, for the bridge wall! I remembered seeing the heads of the spectators disappearing from the other side of the bridge wall, before I hit the bridge (no straw bales in those days) and bounced off, breaking the back brake pedal off. Somehow I managed to stay with the bike. I stopped the machine some way down the road and put it in the hedge. I crossed the road and went back to retrieve the brake pedal, fearing that it would create a hazard for following riders. As I crossed the road again I heard the roar of another bike coming round the corner, so I sprinted for safety. Recklessly I put one hand on the low bridge wall and vaulted over. It was only then, when I was in mid-air, that I found to my horror the other side of the wall was about 12 feet down into a field! Fortunately I landed without injury. The spectators said I gave them two heart-stopping moments. I said I had a worse fright as I was on the bike! Then I found out how I had been deceived by the drop. The spectators were standing on a small ledge at the back of the bridge wall, which created the illusion, for me, certainly, that the ground was the same height on both sides. It is all too easy to be right in hindsight, but I should have respected the well-known proverb, Look before you leap!